Cub Creek Science Camp sits on 350 acres of gorgeous forest with an incredible diverse landscape. We have rocky glades, grassy valleys, ponds, creeks and even a cave. Camp has changed quite a bit over the last 20 years! Cub Creek found it's current home at Bear River Ranch in 1999. The property was home to Campfire Girls Camp many years before us. There are even little bits of that old camp still around today and can be found in both the cabin villages. In 2016, we upgraded a major part of camp - the Dining Hall! That building is not represented on this map. Including the dining hall, we also acquired 100 more acres of land including Spencer's Cave! This cave is where we have been taking campers spelunking for years! 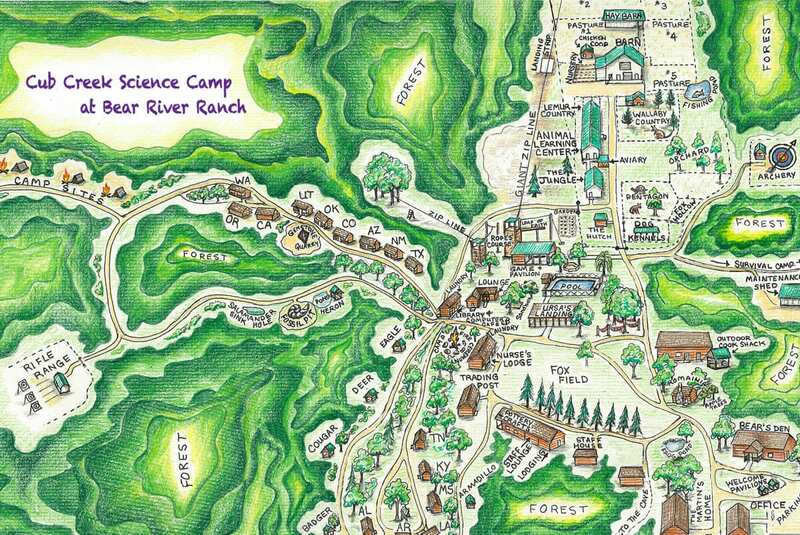 The map below was hand-drawn by a member of our camp family Tabitha Gill in 2012. As camp has grown, we've been unable to part with this beautiful piece of camp history! But this map represents main camp including the Animal Area, our 15 cabins, the Ropes Course, and all of camp's most frequented locations. Check out our camp with the map below!